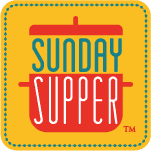 It’s the last Sunday of the year and #SundaySupper is celebrating with Reflections and Resolutions. I’ve been thinking hard about my resolutions for 2014 but personally and for the blog. One thing I want to do in 2014 is to move my blog to WordPress. It’s scary but I think it’s time. Another blog resolution is to be more involved in social media. This means I not only want to share my own posts more often, I want to share other food bloggers posts more as well. I have a ton of other goals and resolutions as well but you’ll have to wait until next year to see how they are coming along! One thing I have been doing every year is making a list on my birthday of things I want to accomplish throughout the year. Since my birthday is in the summer, I’m about halfway through. I figured the best way to end 2013 was to check one of these off the list. The one I’ve really been wanting to make is risotto. I have never made it and have always wanted to and I just happened upon a recipe in Cooking Light so I knew it was perfect. 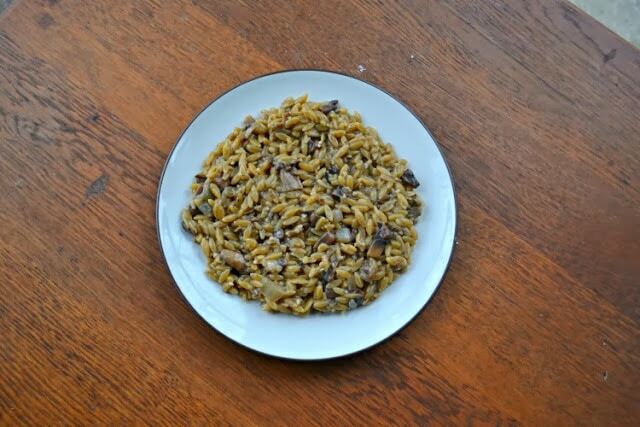 The recipe was actually for a mushroom risotto which I thought would be really good. It had several types of mushrooms, wine, and the rice/pasta for the risotto. It took a while to make but was actually a very simple recipe. I loved how it turned out! The pasta was surprisingly firm and full of amazing flavor. I figured cooking it for so long it would be starchy and mushy but it wasn’t at all! This was the perfect meal to serve along side a salad and call it a day. 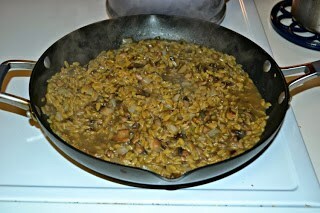 I can’t wait to try another type of risotto next time! 1. Bring 1 1/2 c. chicken broth to a boil. Add in porcini. Let stand for 30 minutes. Drain in a colander over a bowl to catch the liquid. 2. Combine the porcini soaked liquid along with the remaining chicken broth. 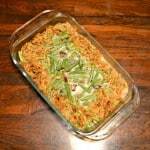 Bring to a simmer in a saucepan. Reduce heat and keep warm. 3. Heat a large skillet over medium heat. Add the olive to the skillet and add in the onions. Saute for 5 minutes or until tender. 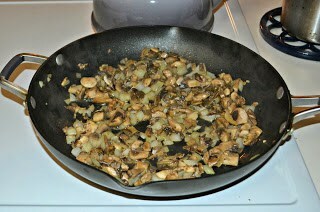 Stir in the mushrooms and cook for an additional 5 minutes. Stir in the porcini. 4. Add in the rice or pasta and saute for 1 minute, stirring constantly. Add in the red wine and cook for 1 minute or until liquid is absorbed. Stir in 1 cup of chicken broth. Cook for 3 minutes or until liquid is nearly absorbed. 5. Add the remaining broth 1 cup at a time, stirring constantly until the liquid is gone before adding more broth. Reserve 1/3 cup of broth for later. 6. Remove the skillet from heat and add in 1/3 cup of reserved broth, Parmesan cheese, salt, pepper, sage, and parsley. Spoon into bowls and garnish with additional Parmesan cheese and sage. 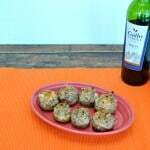 Check out our#SundaySupper Pinterest board for more fabulous recipes and food photos. Your risotto looks perfect, Heather! Checked off your list! Wishing you a joyous new year, my friend! It has been such a pleasure getting to know you in 2013. 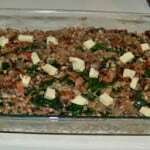 I love your blog and recipes and look forward to seeing the exciting changes in 2014. I hope we have the opportunity to meet IRL in 2014. Risotto is simple and it takes time that is well worth it in the end. It’s so creamy and delish. Mushroom was an excellent choice for your first batch and I can’t wait to see which flavors you make in the coming year. Good luck on switching to WordPress and I hope the transition goes smoothly. And best wishes to you and all your endeavors in the coming year. Your risotto looks perfect! It’s been so nice to cook along with you this year! Yum! Risotto can seem so daunting but this looks amazing. This was a year that I made a lot of risotto. I’d made some in school several years ago, but not since then. I’d forgotten how wonderful it is, and easier than I had remembered. Love, love your mushroom version. Have a wonderful New Year!! I made a bucket list this year and have only crossed a couple things off of it. I really hope I can make more of an effort to do big things I really want to do next year. I’ve never made risotto either, in fact, I’ve never eaten it. I will have to try this recipe. 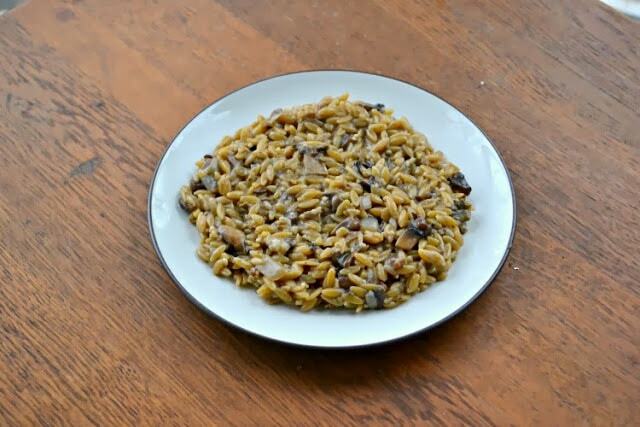 We are huge risotto fans and your mushroom risotto looks fantastic! 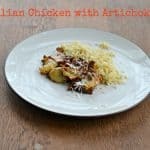 Your risotto looks so darn good! I don’t really make it, it looks like I should start! I love risotto. Especially mushroom risotto. Unfortunately my wife isn’t crazy about it so I never make it at home. This dish would also be fantastic with a glass of Pinot Noir. Happy New Year! This looks so delicious. I would love to give this a try. Happy New Year! I have yet to make risotto and yours looks so delicious!! I can’t wait to try it! Happy New Years to you!! I’m sending this to my mom, shes a risotto queen and (like me) loves mushrooms! I love risotto and I love mushrooms in anything. Can’t wait to try this.